Transportes Colectivos, S.A. has been offering passengers road transport services, both urban and suburban, in Bilbao’s metropolitan area, for more than 100 years. Until the recent inauguration of underground train services, urban public transport services were offered exclusively by our company. 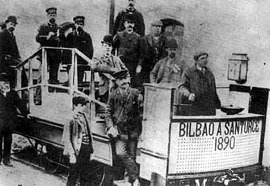 The underground was in fact a milestone, for it provoked remarkable changes in the use of public transport and the mobility of citizens within Bilbao’s metropolitan area. The biggest challenge facing those who participate in the management of citizen mobility in Bilbao and the whole of Biscay (public management companies, politicians, private operators, social agents and citizens themselves) is urban sustainability in all of its interpretations, in addition to mobility and accessibility. It is essential to develop a series of initiatives which are not only directed at increasing the services offered -which are already quite considerable- but which also promote educational campaigns and implement policies aimed at a more rational use of the private automobile. Such a philosophy will help us face the many challenges posed by the new century. We firmly believe that surface transport plays a key role in the resolution of mobility problems. In collaboration with the other means of public transport, we will work hard to improve and to provide our citizens with a better quality of life. And we will do that according to demands of modern life and of the times we live in, paying special attention to quality of service and the environment, fields in which we are currently developing important initiatives. Transportes Colectivos, S.A. will always be up to the task of providing the quality of service which Biscay in general, and Bilbao’s metropolitan area in particular, demands.